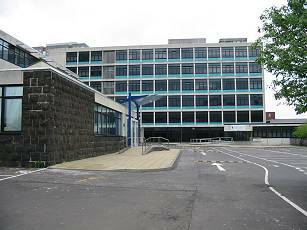 Allan Glen’s School, founded in 1853, developed from a school providing a "good practical education for the sons of tradesmen", to being the principal science school in Scotland and was often referred to as ‘the High School of Science. Most pupils attended Allan Glen’s after having gained a scholarship for the first three years and so the range of pupils extended across all social classes, and many of the former pupils proceeded to senior posts in business, industry and medicine. The Allan Glen's Endowment Scholarship Trust awards scholarships to help pupils of Glasgow schools who are about to study engineering at a British university. The funds came to light after the closure of the school, and it was felt that this use of the funds was very much in the spirit in which Allan Glen made his original bequest. The Trust also runs an annual Allan Glen Tribute Lecture attended by many schools, with guest speakers who aim to stimulate interest in engineering. It must say something that in recent years the Chancellorships of all three universities in Glasgow (Glasgow, Strathclyde and Glasgow Caledonian) have been held by former pupils of Allan Glen's - Sir Kenneth Calman and Lord Smith are Chancellors of Glasgow and Strathclyde Universities respectively, and until a few years ago Lord Gus McDonald was Chancellor of Glasgow Caledonian University. 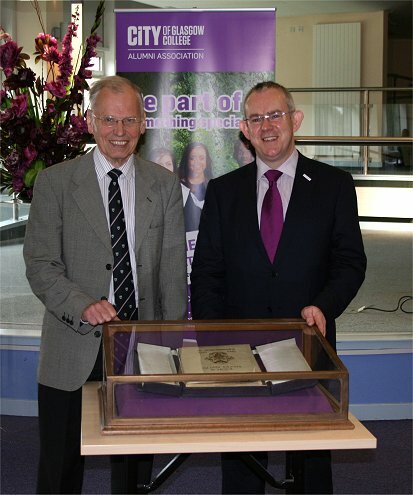 Mike McCreery presents the School's Book of Remembrance to Paul Little, the Principal of the City of Glasgow College. The book is on display in the College's library in the new campus built on the site of the Allan Glen's building.